Posted on December 12, 2016 at 10:00 am. Once you’ve chosen your ingredients and recipe, it’s time to make soap. There are two main ways to make soap: Hot process and cold process. In hot process soap making, the saponification reaction is completed before the soap is moulded. 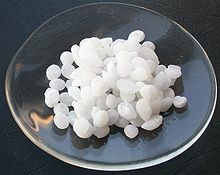 In cold process, the saponification reaction is initiated and then left to complete while the mixture is in the mould. Cold process makes it easier to have a nice smooth top and also makes it easier to add swirls of colour and inclusions. It is recommended that one wait 4 to 6 weeks before using cold process soap. Hot process has the benefit of making useable soap within a few hours. Hot process also makes it easier to add delicate additives like milk and honey, which change with heat. Although the hot process soap can be used immediately, it is better to wait 1 to 2 weeks after making the soap to allow any excess water to evaporate and give a harder and longer-lasting bar of soap. Clean up is also easier with hot process soap, since all the tools tend to have soap on them already. Soap ingredients/recipes are the same with either method, it is only the process you follow in making the soap that changes. I have no experience with cold process soap, so I will explain how I make hot process soap below. This is a basic process for an oil-only, sodium hydroxide-based soap. Before beginning any soap making, be sure to check the recipe with a soap calculator. I listed a number of these in Friday’s soap recipe design post. The first step in making soap is the weigh the oils. I use a kitchen scale to do this. In fact, I like to use the kitchen scale in conjunction with the oil weighing to make sure my recipe is as accurate as possible. Place the pot on the scale, then press tare to reset the scale to zero with the weight of the pot included. Add the first oil, as accurately as you can. If the final weight is a bit off of the recipe, change the value in the soap calculator to reflect this and recalculate the recipe. Press tare to reset the scale’s readout to zero. I repeat steps 2 and three for each oil, always resetting the scale so that I only measure the weight of the oil that I am adding and making sure that my recipe stays within desired parameters. I make adjustments to the amounts of remaining oils if needed. Once the oils are all added to the pot, I put the pot onto the stove and set the heat to low. Now that I have all of the oils added, I recalculate the recipe in the soap calculator one last time. This makes sure I have the most accurate possible calculation for amounts of lye and water. Important: Lye is a very strong base and can be dangerous if used incorrectly. Use caution and follow all safety precautions. First, measure out the water. Use the same method as you did with the oils. Discounting – It is possible to set some of the water aside to add at the end of the cook. I like to set “discount” about 20% of the total weight of water, but you don’t have to discount at all. I have heard of people adding only the same weight of water as lye and saving the rest of the water for the end of the cook. I would not recommend discounting any more water than that. Next, in a separate container, weigh out the lye, again using the same weighing technique as with the oils. It is recommended that you wear gloves and goggles when working with lye. If the lye touches your skin, flush you skin with water immediately. Make sure you are in a well-ventilated location. Very important: Add the lye to the water. DO NOT add the water to the lye. The lye will immediately begin to react with the water, creating a large amount of heat and releasing dangerous fumes. If the water is added to the lye, the small amount of water present at the start of the reaction can cause the lye water to bubble and spit, causing chemical burns. If you have used sodium hydroxide, you will likely need to give the mixture a short stir to fully dissolve. If you are using potassium hydroxide, a tiny swirl should dissolve the chips. Allow the mixture to sit in a well-ventilated place until it turns clear. Once the oils are all melted/liquid and the lye solution is clear, carefully pour the water and lye solution into the oils. The most dangerous bits are now done. Some people say not to stir, but I like to give it a small stir, and then occasionally stir throughout the cook. As you cook the mixture, it will become more grainy. During the cook, the lye is not yet fully reacted, so if you happen to get some on your skin, rinse the area well with water. I would love to tell you that this next part is 100% straightforward. The truth is that I don’t have it mastered. I have had the best results when I cook until it has an applesauce-like texture, and begins to boil slightly, starting to boil again a bit after I stir it with a spoon. When this happens, I take the pot off of the heat and add the reserved water, if any. I then plug in the immersion blender, and blend like crazy until the mixture becomes lumpy like mashed potatoes, with a vaseline-like look. It should pull towards itself, and away from the sides of the pot, just slightly. If you continue to blend too long especially in the warm pot, the mixture begins to turn more opaque and lighter in colour, a sign that it is overcooked. Overcooked soap is still effective as soap, but it may be very crumbly. It’s important to test to make sure that all of the lye in the soap has reacted with the oils. If there is still some unreacted lye remaining, the soap will be very harsh, and possibly painful on the skin. The lye solution has a pH of around 14, while skin’s ideal pH is around 6 to 7. It is possible to test the soap mixture with a pH strip to see when it is fully reacted and all of the lye is gone. The pH should drop considerably from that of the lye solution, down to somewhere in the range of 7 to 10. I use the more “hokey” approach, that is touching a small amount of the mixture to the tip of your tongue. The soap is fully reacted when the soap doesn’t “zing” on your tongue. If the lye has been fully reacted, your soap is mixed to a mashed potato consistency with a vaseline-like sheen, and the mixture is pulling together a bit, the soap is ready! If the lye is not fully reacted, pop the mixture back onto your stove a little longer and then blend again after rewarming until it is ready. Hot, fresh soap will be very squishy and jiggly, but can harden quickly, depending on a number of factors. If you have a wooden soap mould, you can line the mould with parchment or waxed paper and put the soap directly into that, shaking or tapping gently to settle out any bubbles. Silicone moulds also work, but you want to make sure that you don’t leave the soap in the mould any longer than necessary, as it will continue to release water for quite some time, hardening, and silicone prevents water evaporation. If you don’t have a soap mould, there’s hope for you. Anything heat-resistant can be used as a soap mould. I don’t have a proper soap mould. I’ve used rectangular glass containers, Pringles cans, Dixie cups, paper condiment cups, and even cardboard boxes, appropriately lined. Leave the soap to cool in the mould, then carefully remove it from the mould. Although hot process soap can be used immediately, it will be longer-lasting if you leave it in open air for one to two weeks to release more water and harden. This will also allow you to watch for any excess lye crystallizing on the surface, which would be an indicator of an incomplete cook. If the soap needs cutting, cut it with a knife before it gets too hard and brittle. After quite a while (usually at least months, if not longer), areas of the soap that have been in contact with air can develop yellow or orange splotches. This is an indication that the oils that were not saponified have turned. The soap itself is not harmed by this and can still be used. To prevent this from occurring, wrap up your soaps in more air-resistant packaging after they are fully cured, and avoid using oils with a short shelf life in large quantities. I wanted to provide you full step-by-step pictures of the process. Despite making almost 60 successful bars of soap in six batches over the past week, I regret to say that I can’t do that. I made the first three batches before realizing that I needed to take pictures for this post. I overcooked my first soap, and the other two were great. Then I overcooked another soap (it was my first time adding clay and botanicals, and I wanted to wait until the soap was somewhat cool before adding the plant ingredients), and both undercooked and overcooked the next one. (It’s a long story. I had divided the unblended soap into two parts to add different additives. I managed to fix both halves, but the pictures would not have been helpful except as a guide of what not to do. Hint: If your blended mixture looks like and moves like pudding, it’s not fully reacted.) The last batch was pretty good, but I had added coffee grounds and brown clay and cocoa, so the visual on what a soap cook should look like was very…different. If nothing else, the above represents a starting point to understanding where soap comes from, how it’s made, and what not to do. I hope that more people will be encouraged to try out this awesome and useful skill. What are your favourite soap recipes? Comment below.